Artistry In Ensembles, Book 1 - Violin composed by Robert Frost, Deborah Monday. Orchestra. For violin. Method book. Artistry in Strings. Book A,1. Method book. Published by Neil A. Kjos Music Company (KJ.106VN).ISBN 849734223.Artistry in Ensembles offers new and exciting original pieces, transcriptions of old favorites, and spectacular folk song arrangements in a versatile three-part format. Teachers can augment their rehearsals and performances with the piano accompaniments and optional percussion parts.About Artistry in StringsArtistry in Strings is a groundbreaking string method that will be at home in your classroom or private studio. Its comprehensive approach contains all the basic tools necessary to establish solid technique and expressive music making. 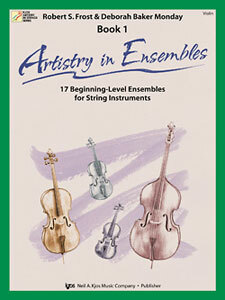 Artistry in Strings is a music educator's dream, combining a performance-centered approach with optional theory, composing, listening, assessment, and interdisciplinary and multi-cultural studies.Authors Robert S. Frost, Gerald Fischbach, and Wendy Barden have combined their vast experience as educators to provide a string method that is well paced for all types of beginning string classes. Regardless of class frequency and duration, or class size and student age, Artistry in Strings will assist you to achieve superior results.